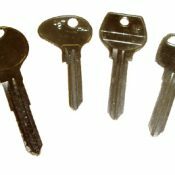 A key for Mazda cars manufactured between 1970 and 1995 cut to number or photo, except those with a laser cut key. Models Include: 1200, 1800, B1800, E1600, GLC 323, R100, R1200, Cosmo, RX2, RX2 Capella, RX3, RX4 Luce, RX5 Cosmo, RX7 Coupe, RX7, 616 Capella, 618, 818, 808, 121, 323, 626, 727, 929, MX3, MX5, Xedos, MX6, Navajo, Eunos Roadster. We do not use original Mazda blanks, we use high quality steel blanks manufactured by Silca. A key blade to fit Mazda Flip key remotes, cut to the locks on your car. Models include: CX-7 2007 on, CX-9 2007 on, Mazda 2 2007 on, Mazda 3 2007 on, Mazda 5 2007 on, Mazda 6 2007 on, MX5 2007 on, RX8 2007 on. The key number is likely to be a 5 digit number. 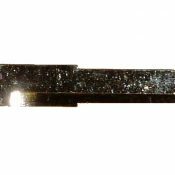 A Mazda Laser key for any car manufactured before 1994 cut to key number. Models Include: Xedos 9, Eunos 800. Please enter your key number during the checkout process. An emergency key for Mazda cars, cut to fit the locks on your car. 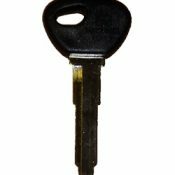 This key will suit most models from 1995 onwards. NOTE: This key does not include the transponder chip. Models Include: 121 1997-2001, 323 1995-2006, 626 1995-2006, cx-7 2007 on, cx-9 2007 on, Mazda 2 2003 on, Mazda 3 2004 on, Mazda 5 2005 on, Mazda 6 2003 on, MPV 2000-2006, MX-3 1995-1999, MX-5 1995 on, MX-6 1995-2008, Pickup 1999-2001, RX8 2004 on, Tribute 2001 2007, Xedos 6 1995-2005, Xedos 9 1995-2005. 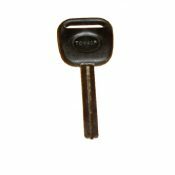 A chipped Mazda car key cut to photo or key number for cars manufactured after 1995. This key will need programming in order to start the engine. Models Include: 121 1997-2001, 323 1995-1999, 626 1995-1999, CX-7 2007 on, CX-9 2007 on, Mazda 2 2003 on, Mazda 3 2004 on, Mazda 5 2005 on, Mazda 6 2003 on, MX-3 1995-1999, MX-5 1995-2002, MX-5 2007 on, on, MX-6 1995-2008, Pickup 1999-2001, RX8 2004 on, Tribute 2001 2007, Xedos 6 1995-2005, Xedos 9 1995-2005. This does not include the following vehicles: 323 1999-2006, 626 1999-2006, MPV 2000-2006, MX-5 2002-2006. These vehicles require a Temic Transponder Chip, please see item below.